French designer sportswear, Delineator, February 1928. Illustration by Leslie Saalburg. From left, Chanel, Lelong, Vionnet. The Vionnet is trimmed with applique. The coat is by Frances Clyne, a top-level dress shop; the evening gowns are couture designed by Louiseboulanger and Chanel. Delineator, February 1928. 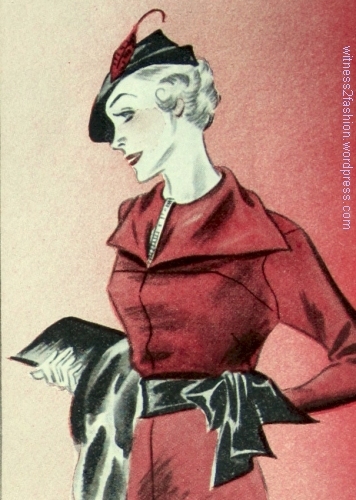 Corduroy sports coat by French couturier Jean Patou; illustrated in Delineator, February 1928. “Patou makes a sports coat notable by such details as pale emerald green corduroy, the slot seams, the yoke, the patch pockets, the steel buckled belt, and a glistening black patent leather flower on the left lapel.” It’s cut almost like a shirt. I wonder: did the black patent leather flower inspire Chanel, or was it the other way around? 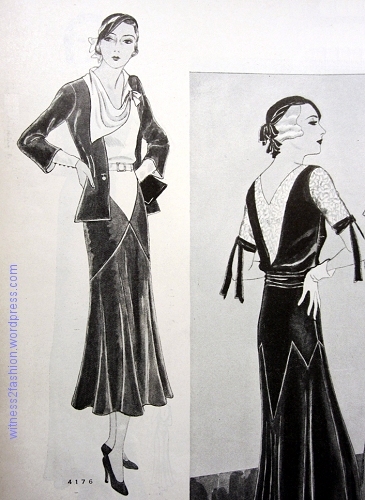 Black crepe satin dress with raglan sleeves by Madeleine Vionnet, illustrated in Delineator, February 1928. 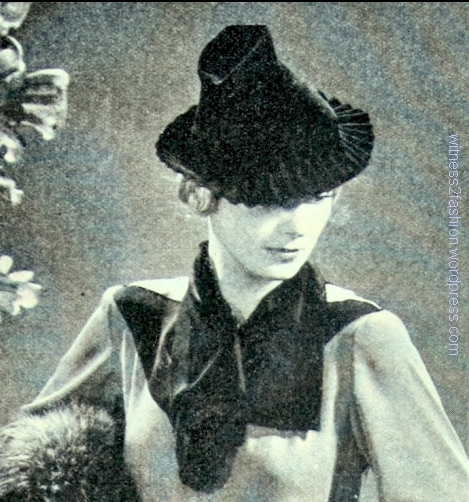 The hat was designed by Suzanne Talbot. Thanks to a lecture by Sandra Ericson, I know that the tucks in the bodice fabric would have been done on the straight of grain, and the bodice pattern would then have been placed on the fabric with the center front and back aligned with the bias. Vionnet sometimes used fabrics so wide that they had to be custom woven. We could imitate this bodice by hiding a seam under one of the tucks, if necessary. 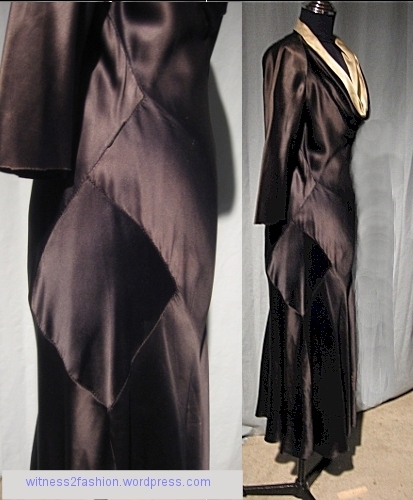 The original was in crepe satin, but I can imagine it inspiring a modern top with sheer black sleeves…. This white satin evening dress from Lanvin is really typical 1920’s style, with its beaded hip band and simple lines. 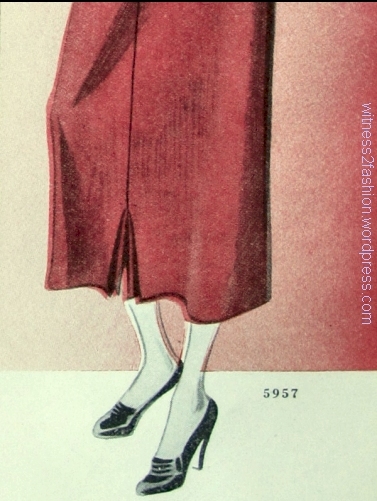 A cape was often seen on twenties’ patterns, but, being optional, many dresses were made without the cape. Delineator sketch of a couture gown by Lanvin, Paris, February 1928. “Lanvin puts a swinging cape on this white satin frock, since the back is so important a part of a dress for dancing. 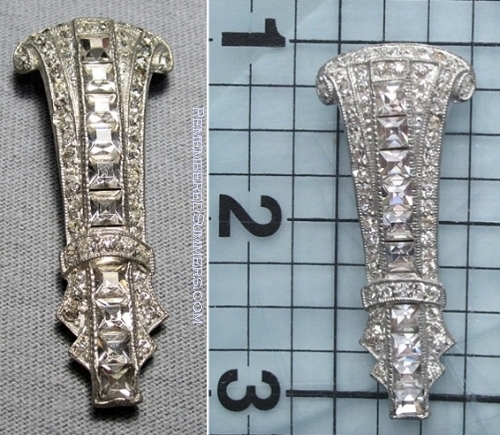 The waistline is banded with feathery embroidery in small silver and white pearl beads.” That center panel would also be lovely for dancing, and, like the Chanel gown, it seems to have a “paste” jewel as an accent. A stack of bangle bracelets was also a chic Twenties’ touch. The V-neck on the back of this turquoise couture gown by Paquin is echoed in the hip band and scalloped hemline. The hip band tied in front. Photo from Delineator, February 1928. 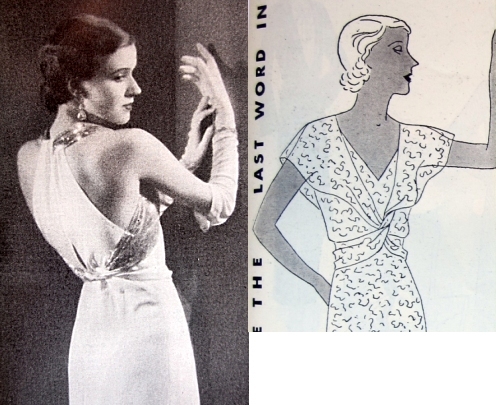 [I think a “flesh” or “cafe au lait” lace inset (or slip) can be seen in the low neckline opening.] This couture original was imported by Hattie Carnegie‘s New York store. According to Lizzie Bramlett, writing at the Vintage Fashion Guild Fashion History site, customers could buy a Paris original from Hattie Carnegie, or buy one of her copies, made in New York. 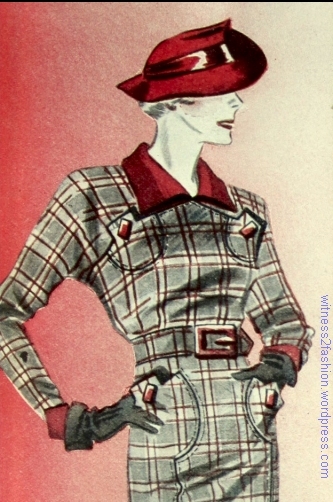 For sporty, daytime wear, she sold this four-piece tweed wool suit, coat, and pullover outfit designed by Molyneux. 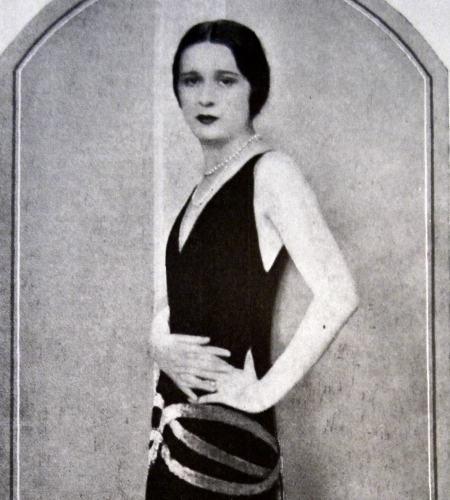 A four-piece couture wool ensemble designed by Molyneux and available from Hattie Carnegie in New York; Delineator, February 1928. 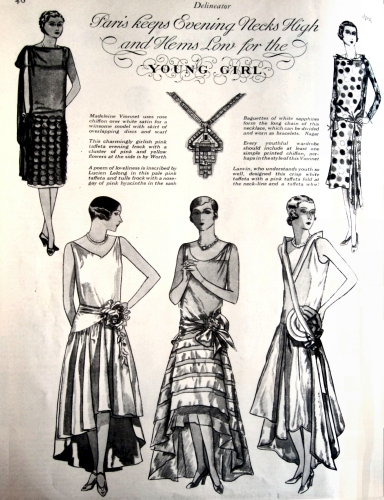 Fashion trends as reported in Delineator magazine, February 1928, page 31. You can also watch her free online class in patternmaking “from sketch to pattern.” ) On my computer it took a very long time to load, but a long-ago class — in grad school — when I first learned about “pattern manipulation” was one of those life-changing moments. The lecture included plenty of visual material, with slides and half-scale versions of Vionnet designs from the early 20’s through the end of the 1930’s. Obviously, it’s hard to to do her lecture justice without her slides, but Ericson also recommended some books on the life and work of Madeleine Vionnet, especially Madeleine Vionnet by Betty Kirke (available from Amazon for as little as $76). 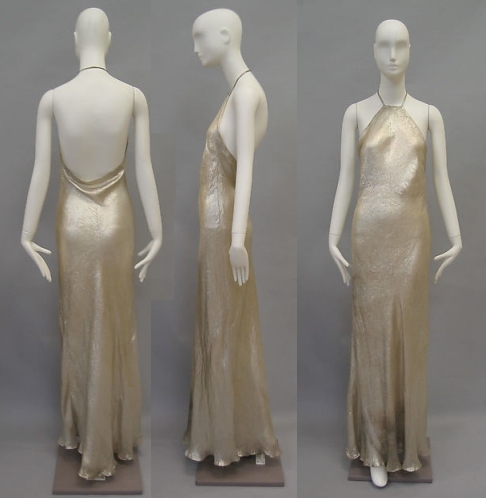 Another, Madeleine Vionnet by Pamela Golbin, is also available for $75 or so, used. 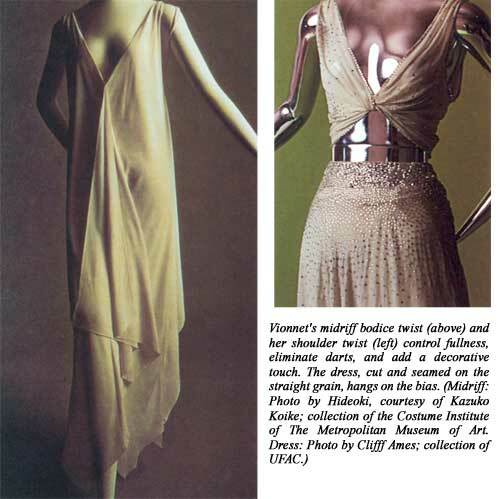 Betty Kirke also wrote a “must read” article about Vionnet for Threads Magazine, which you can read online (illustrated). It has some amazing pattern layouts! Velvet gown by Vionnet, photographed by Edward Steichen. Advertisement in Delineator, 1925. 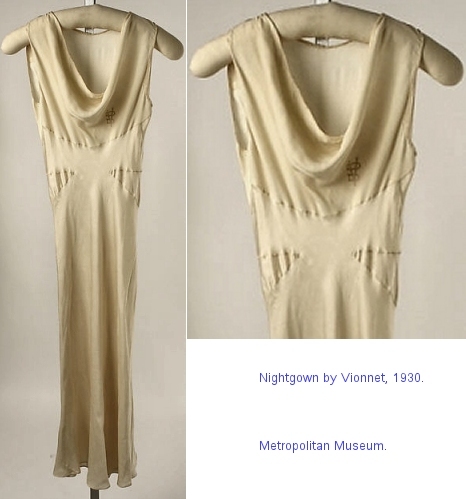 Also just a click away is an article in Threads Magazine which shows half-scale reproductions of Vionnet designs. 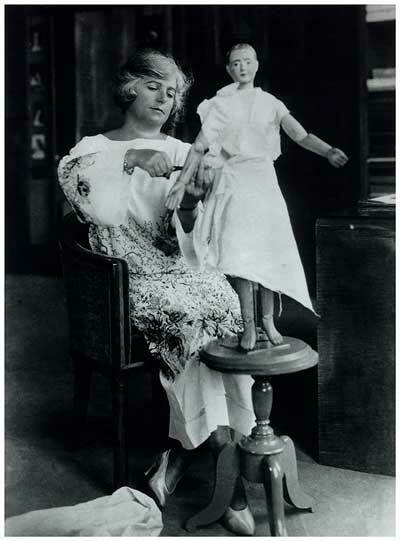 To read read “Vionnet in Miniature” (click here). (Where can you get an affordable half-scale mannequin? Ericson ingeniously makes them from My Size Barbie dolls — and sells a pattern for turning a Barbie figure into a human figure for about $13. (See it here.) The doll is not included — they cost about $60 online. These are notes I took at Sandra Ericson’s 2010 lecture on Vionnet — any errors are mine. The patterns used for illustration are not by Vionnet, but show her influence. My drawings are pure conjecture. Ericson divided her lecture into “6 Principles of Elegant Cutting” – “epiphanies” she had while studying Vionnet. Vionnet as Architect: Vionnet thought of herself as an architect or geometrician. Her design goal was simplicity and integration. Integration: nothing is added that isn’t part of the whole (no trims, etc., that don’t have a function) and Simplicity: achieve the most design excellence with the least amount of “work” – that is , the fewest seams/cuts possible. Vionnet’s Fabrics: Ericson also gave a list of fabrics that work best for Vionnet’s approach: those that have a balanced thread count, a loose weave (not synthetic, usually), twisted yarns, less friction (so they flow over the body), less dimensional stability (seek fabrics that do NOT keep a square well) and weight: Rayon, silk, wool, crepe chiffon, georgette, twills, nets. 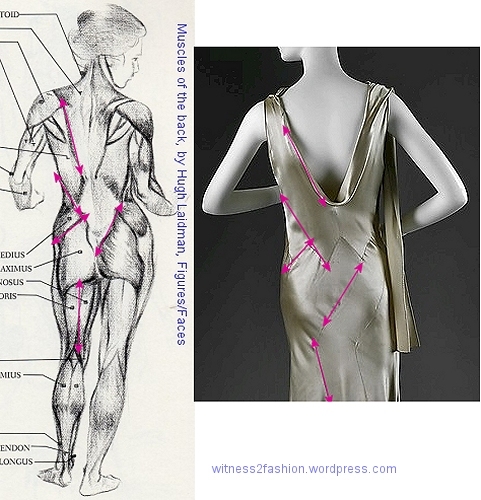 Anatomy and Style Lines: Vionnet stressed the importance of the geometry of the human body: Style Lines – places where the seams go – should coincide with the direction of the muscles. Vionnet thought seams should follow the lines of our musculature. Anatomical drawing by Hugh Laidman in his book Figures/Faces; Vionnet gown photo from Metropolitan Museum. 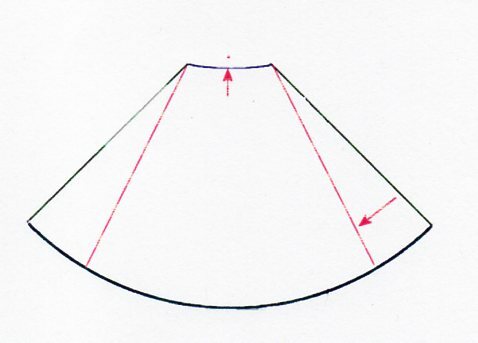 Principle 1: Cut geometrically. 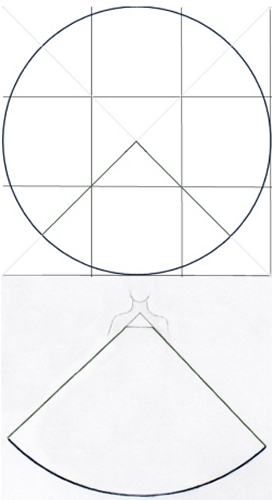 Vionnet based her cutting on circles, squares, triangles, rectangles, and especially on the quadrant (quarter) of a circle. 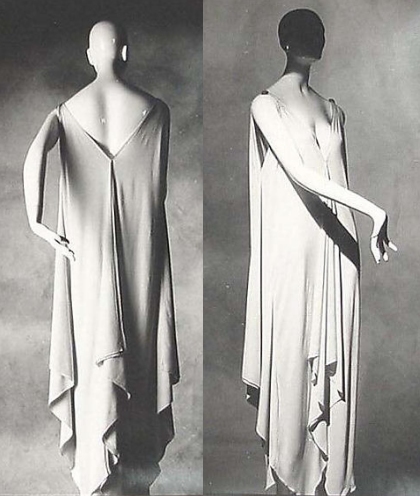 Vionnet often began draping with a quadrant, sometimes with the tip cut off. Some of her early dresses were cut on the straight, seamed on the straight grain, and worn on the bias. Other gowns were formed from four identical pattern pieces, often cut as rectangles, worn on the bias. (See one by clicking here.) Sandra Ericson reproduced one and wore it: a timeless design. Vionnet dress, 1926-1927. Metropolitan Museum photo. Click image to enlarge. 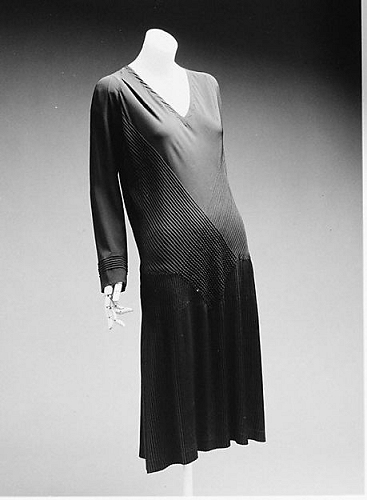 Some of her most influential gowns were based on a quarter circle, slashed to create a V neckline or an armhole, shaped by triangular inserts at waist or hip. . . .
Vionnet nightgown with triangular inserts, 1930. Photos: Metropolitan Museum. An astonishing number of 1930’s dresses are shaped by geometrical inserts which use bias stretch to achieve their fit — even these dresses from Sears. 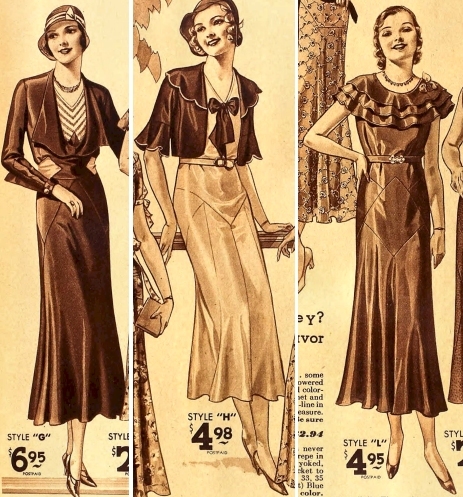 Dresses from the Sears, Roebuck catalog, 1932. It’s tempting to think this dress is simply a quadrant with a halter, but that was just the beginning. Vionnet evening gown, 1936. Collection of Metropolitan Museum. 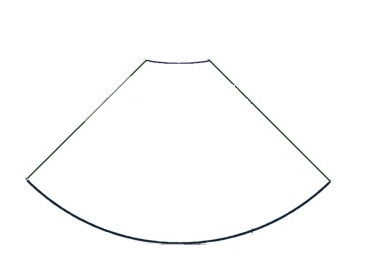 Drawing: A quadrant wrapped around the body and seamed below the waist at center back. However, Vionnet shaped her gown with a side front seam, just visible in the photo. Principle 2: Weight creates fit and form. (Rayon double crepe and 4-ply silk crepe are recommended.) Vionnet’s dresses won’t hang properly unless there is enough weight to pull the bias fabric down over the body. The weight of the fabric will usually do this on a full-length gown, but a knee-length dress will skim and stand away from the body, unless you find a way to add weight. However, Vionnet did this by integrating the added weight into the design, not by weighting it with chain. Chiffon gown by Vionnet, 1926. Metropolitan Museum photo. The trim weights the light chiffon. 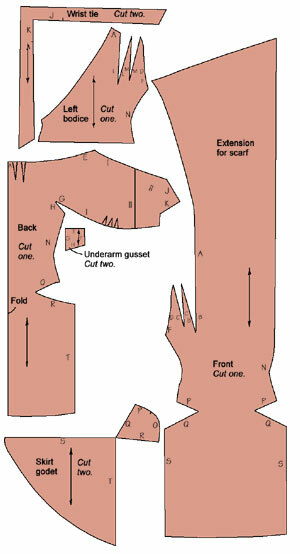 She might use many tucks or applique to add weight on a light fabric, or fur at the hem, or a pattern of fringe. 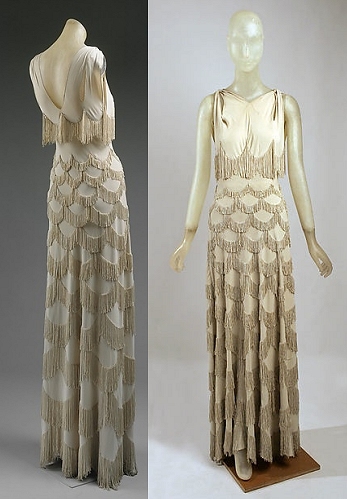 Fringed evening gown by Vionnet. 1936. Photos: Met Museum. 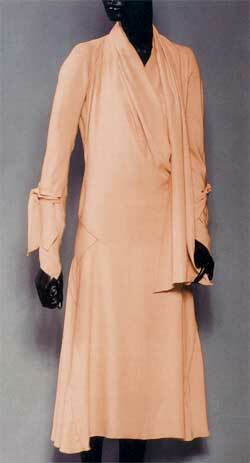 Vionnet evening dress and jacket, wrapped and tied. 1935. Photos: Metropolitan Museum. 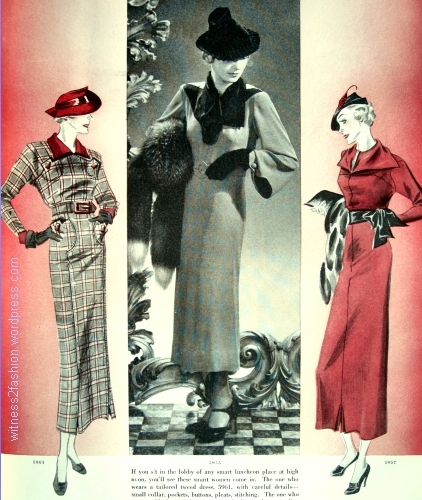 Butterick patterns 4199 (1931,) 4222 (1931,) and 4587 (1932) show the twisted fabrics pioneered by Vionnet. 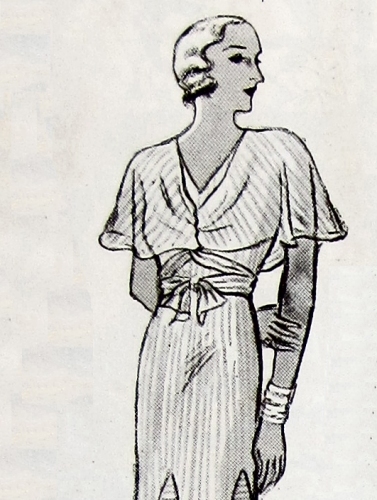 Butterick 4546: “…the cape shoulders, the twisting that Vionnet has made famous, and the wrapping and tying that is very ‘last-wordish’ here now.” Delineator, June 1932. 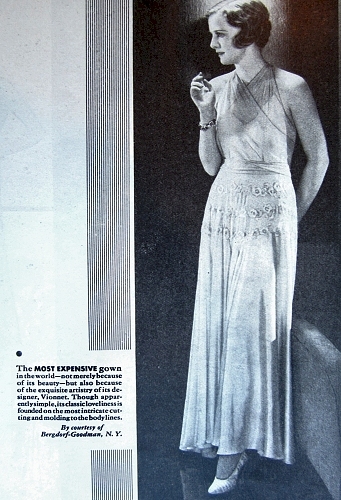 Twisted effects: gown in a Kotex ad and a Butterick pattern, 1932. 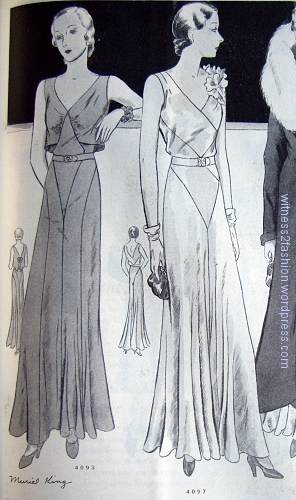 Note how many of these thirties gowns use panels based on quadrants in their skirts. Principle 4: The design should integrate the closure. Vionnet liked closures to be part of the design, not added later. Often a pattern piece extends to become a draped collar, wrap behind the neck, and fall as a scarf or cape over the opening, so that there is no need for a closure. Betty Kirke’s pattern taken from this dress can be seen here. Another view of the dress, showing a rectangular insert in the left side, can be seen here. One Vionnet ‘suit’ which appeared to be a dress and cape was actually a single piece. Principle 5: Decorative details create silhouette, fit, and finish. Work them on the straight grain. 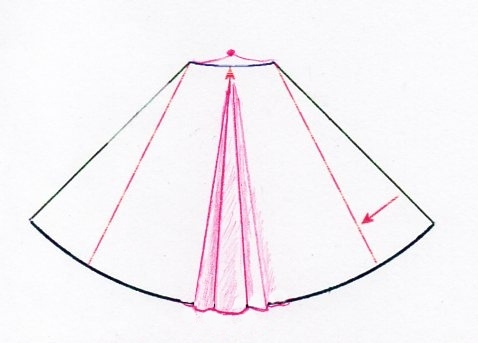 Examples: several rows of pintucks on a crepe day dress appear to form an X from shoulders to hips. They are stitched on the straight, but worn on the bias, and contribute to the structure of the dress. 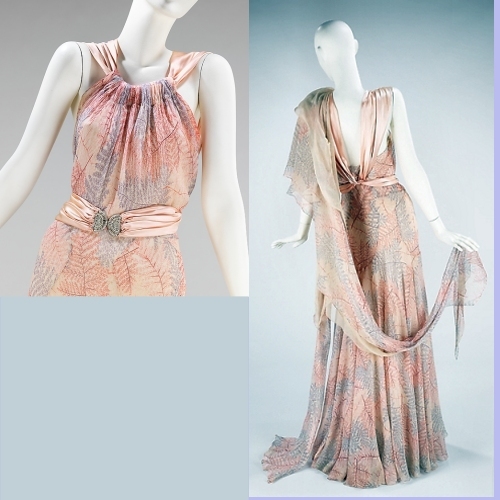 Detail of two Vionnet dresses from the 1920’s. The fabric was tucked on the straight grain, but used on the bias. Metropolitan Museum Photos. 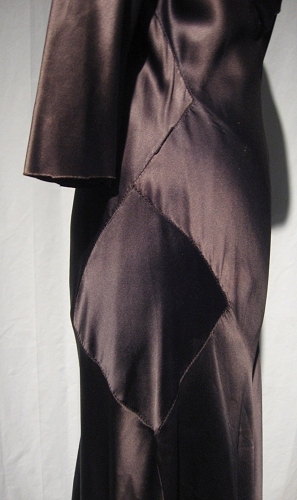 Black silk vintage dress with squares set on the bias and connected by fagoting. Principle 6: Use inserts for specific shaping. 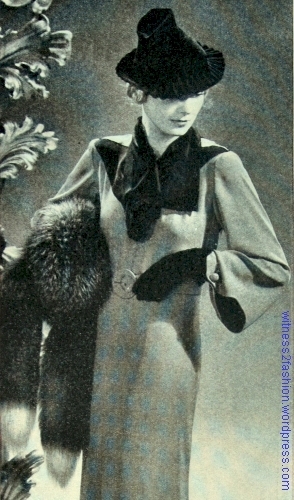 Suit, Butterick pattern 4316, Feb. 1932. The inserts at the hips, and the skirt beginning above the waist, show the influence of Vionnet. Can you visualize the skirt of No. 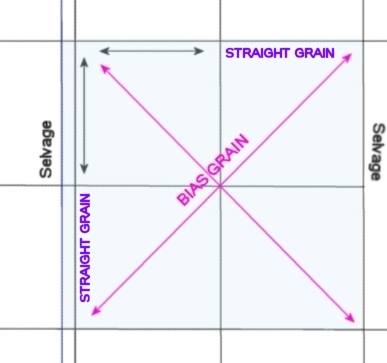 4316 beginning as a straight-grain section of a circle, with straight-grain squares inserted on the bias? (The squares seem to be incorporated into the bodice.) This dress fits closely over the hips without any visible darts to shape it, although there is a bust dart in the bodice. 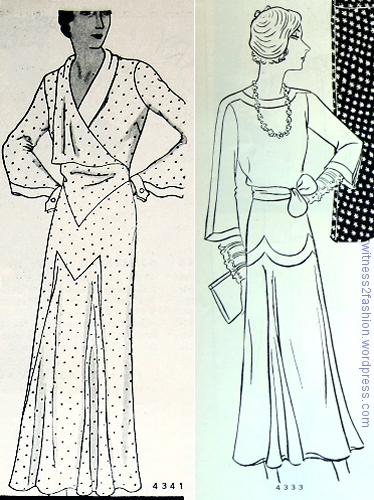 Butterick evening patterns , from 1931-32. 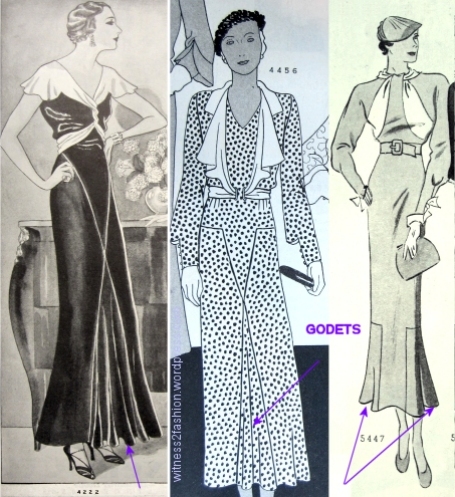 The dress on the right has inserts over the hips; the dress in the center seems to have a triangular insert in the bodice. 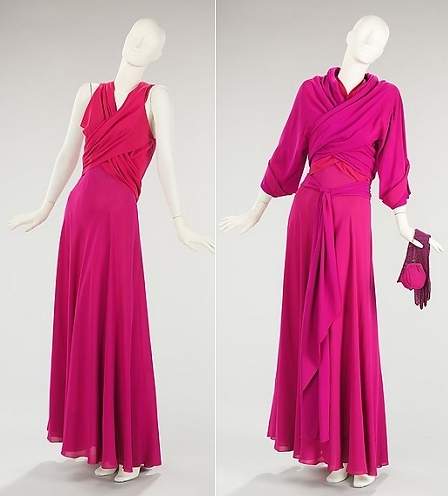 Like the dress on the left, it follows Vionnet’s rule about seams following the muscles of the body. Pure genius! Butterick 3949. Delineator, August 1931. The skirt is based on quadrants and inserted squares used on the bias. This Butterick pattern is clearly influenced by Vionnet. Here are some others: Butterick 3559 from 1931, Syndicate 201 from 1932, McCall 6316 from 1931, Vogue S-3453 from 1931. Vionnet’s fabric was custom made, in widths up to 100 inches! However, you can create your own fabric by piecing straight to straight – just remember that Vionnet would want the new seams to be integral to your design! 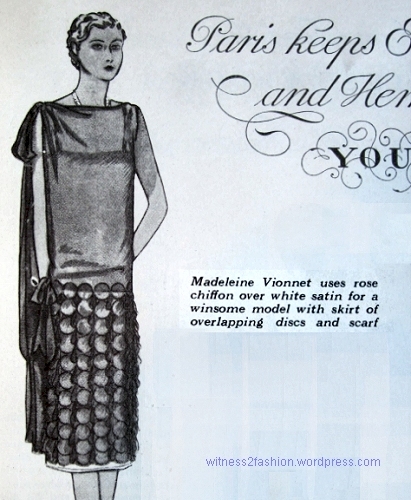 Madeleine Vionnet never re-opened her couture house after World War II, because she knew that her body-conscious clothes were not suited to the military-influenced, shoulder-padded, boxy styles of the 40s, nor to the “New Look” with its elaborate understructures, which depended on reshaping the body rather than working with the body. However, she lived and continued teaching into her nineties, and it’s amazing to realize how much the “look” of the twenties and thirties owes to her – and how much later designers continued to incorporate her genius into the couture. 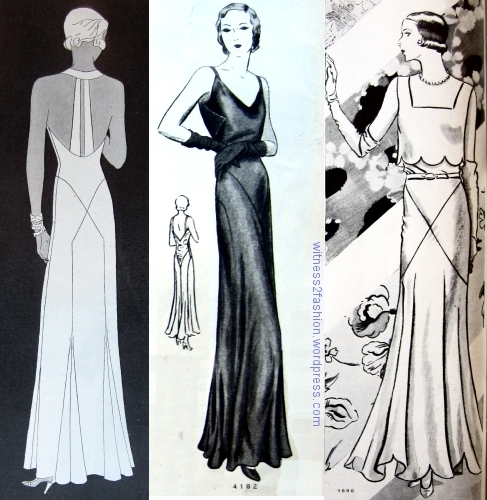 I can’t look at 1930’s fashions without being constantly reminded of the genius of Madeleine Vionnet. She was a successful couturier in the 1920’s, when fashions were mostly tubular, falling with the straight of the grain, but it was Vionnet’s exploration of fabrics used on the bias — which allows woven fabric to stretch — that is, for me, the “look” of the thirties. 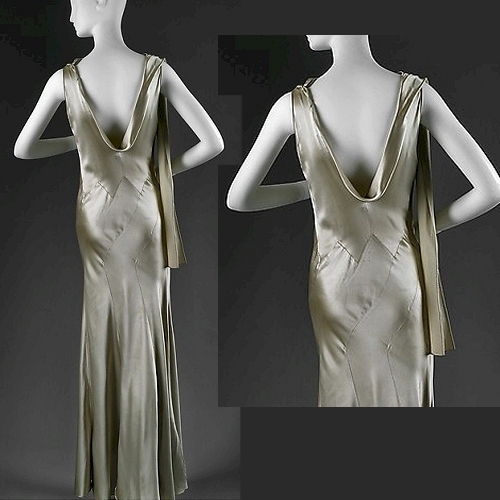 Dresses that cling to every curve and pour over the body like water . . . .
Vionnet bias silk and metallic lame gown, 1936. Photos: Metropolitan Museum. Diamond-shaped bias panels caressing the hips . . . .
Butterick suit pattern 4176. Delineator, Dec. 1931. 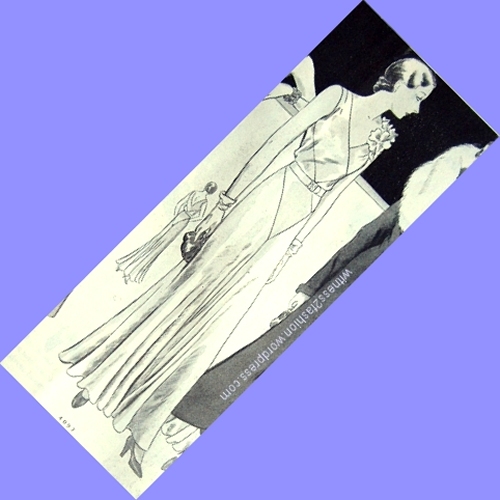 “Mermaid gowns” that glide over the hips and flare near the hem . . . .
Butterick patterns 4093 and 4097; Delineator, Oct. 1931. 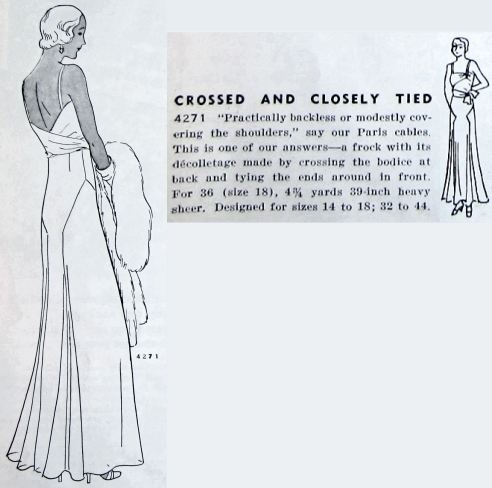 Jean Harlow in a slinky halter dress . . . . All show the influence of Madame Vionnet. As a member of an organization of costumers who work in professional, educational and community theatres, I took plenty of notes and shared them with members who couldn’t attend. I will post them in Part 2 of this series. 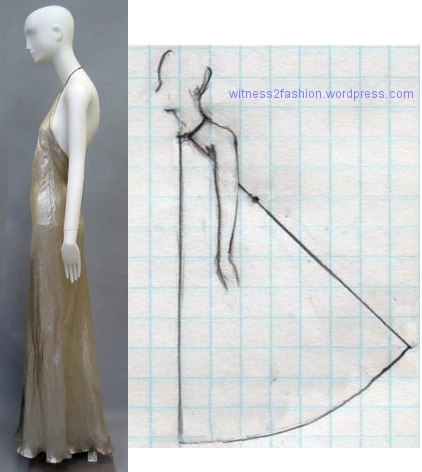 One of the things Ericson said about Vionnet’s draping technique (there is more about it in Betty Kirke’s book, Madeleine Vionnet) was a real “light bulb goes on over my head” moment for me. Actually, since I had been draping and drafting patterns for 30 years at that point, I should probably call it a “Well, Duh!” moment. Butterick evening gown 3696, with square bias panels over the hips. Delineator, February 1931. 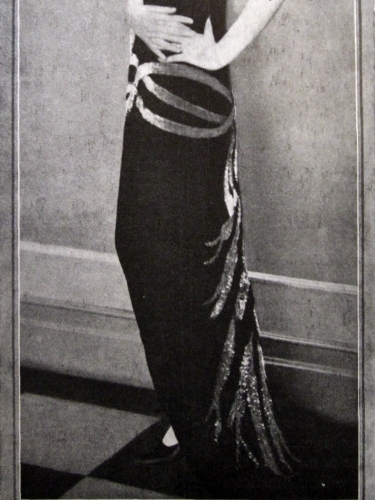 Ericson (and Betty Kirke before her) pointed out that Madeleine Vionnet cut geometrically. Vionnet based her cutting on circles, squares, triangles, rectangles, and especially on the quadrant (quarter) of a circle. Her early 30’s dresses were cut on the straight, seamed on the straight grain, and worn on the bias. [More about that later.] Some of her loveliest bias gowns were based on a quarter circle, slashed to create a V neckline or an armhole, with triangular inserts, or were formed from four identical pattern pieces, often cut as rectangles, stitched on the straight, worn on the bias. Nightgown by Vionnet, 1930. The quadrant has been slit at the top and sides, and triangles inserted at the sides. Photo: Metropolitan Museum. I think these concepts are worth writing about here. Forgive me if I seem to be stating the obvious to some readers; I never took a sewing class until I started my MFA program. My Girl Scout leader taught us how to operate a sewing a machine and use a commercial pattern; after that, I learned mostly from making commercial patterns and following the instructions. 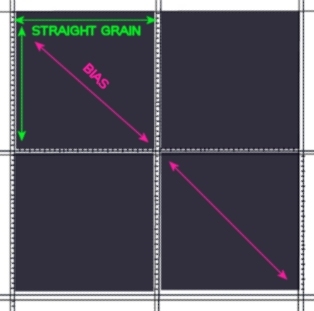 So I knew enough to pay attention to “straight of grain” and “bias grain” when cutting out a pattern; I knew what the words meant, but not how they affected the outcome. It wasn’t until grad school, when I started draping fabric on a professional dressmaker’s mannequin (the kind that costs hundreds of dollars) that I had a clue. Everything that follows applies to simple, woven fabrics, not to knits or stretch fabrics. Fabric is woven with vertical threads and horizontal threads, which wrap around the vertical threads at the sides — this is called the selvage (selvedge in the UK). The straight grain of the fabric runs parallel to the selvage and at a right angle to the selvage ( the cross grain.) 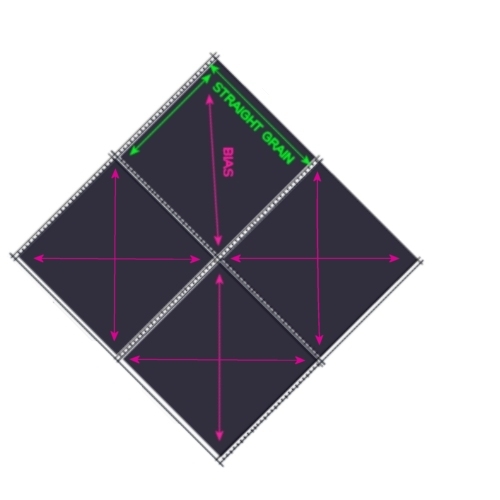 If you draw a line from the top left corner of a square of fabric to the bottom right corner of a square of fabric, that line follows the bias grain. The important thing about the bias is that it stretches. If you pull on a square of fabric with a hand at each side, or a hand at top and bottom, it doesn’t stretch much. But if you take hold of two opposite corners and pull, the fabric will stretch. That is why “bias tape” stretches, and bias cut skirts mold to the body. Suppose that you have cut a simple skirt out of muslin. It has just a back and a front, and each is a quarter of a circle, with a slightly curved line at the waist. Raising the center of the waist just a small amount will change the way the skirt hangs. The sides will move closer together, and the fullness of the skirt, which was evenly distributed, falls toward the center, directly under the place where you raised the waist. Keep this in mind when looking at 1930’s dresses. The tiniest “tweak” at the waist will determine where the folds congregate — to the center, to one side, etc. But, in the godet at the left, below, and the skirt at the right, the fullness has been “tweaked” to force the folds away from the center front. The fabric has been lifted a bit at the points of the yoke. The godet of Butterick 4341 (left) and the entire skirt front of Butterick 4333 (right) have their folds falling from their points of suspension. February 1932. Playing with fabric’s behavior and making discoveries like this is one of the joys of draping. 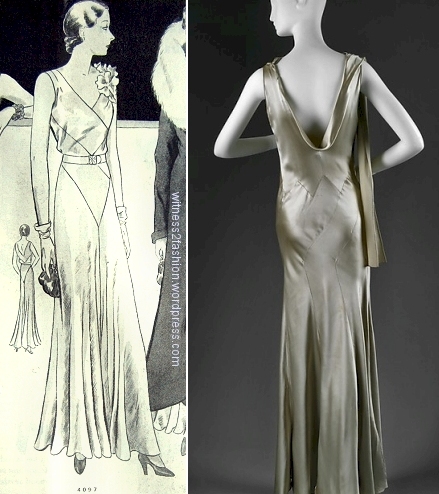 In this evening ensemble from 1932, Butterick mentions the influence of Vionnet. Because the fabric has a vertical stripe, we can see the grain very clearly. The dress is cut on the lengthwise grain, following the selvage. The godets are cut on the cross grain. And the jacket hangs on the bias. 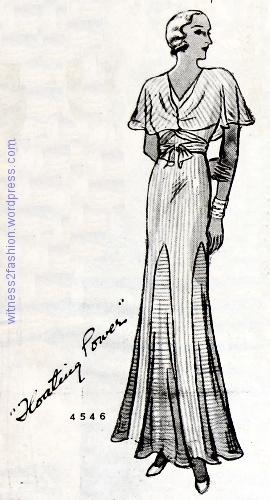 Butterick evening pattern 4546, “Floating Power,” Delineator, June 1932. 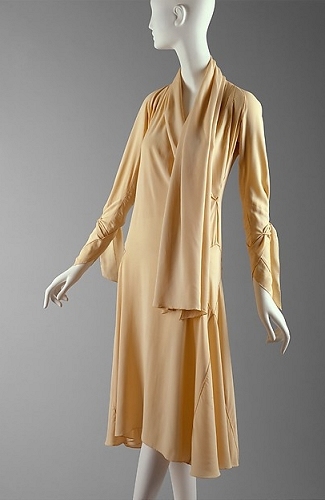 Here is a later wrapped jacket by Vionnet in the Metropolitan Museum collection. Another of those “Well, Duh!” moments for me. 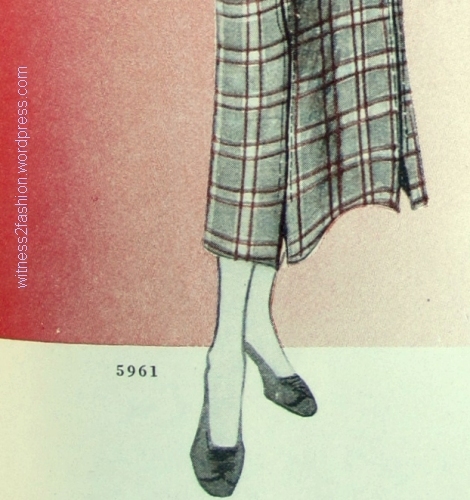 Butterick pattern for 1931. 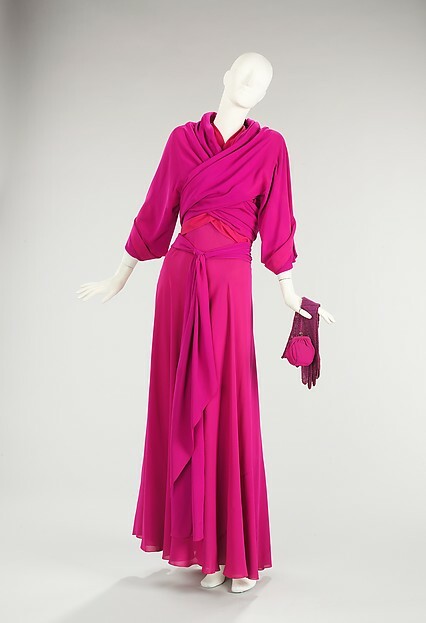 Vionnet Gown dated 1932. Gown photo: Metropolitan Museum. To illustrate “cut and sew on the straight, wear on the bias,” I’m rotating that Butterick evening gown 45 degrees. The panels of the bodice are cut and sewn on the straight grain and used on the bias in the finished dress. Vintage bias silk dress made with squares of fabric stitched together with fagoting. On the right, I removed the confusing shadow. Squares with the seam allowances folded under and connected with fagoting. Now the dress has bias stretch in two directions. Detail of vintage black silk bias dress. Detail of cross-stitch fagoting, which allows the undergarment to show through. 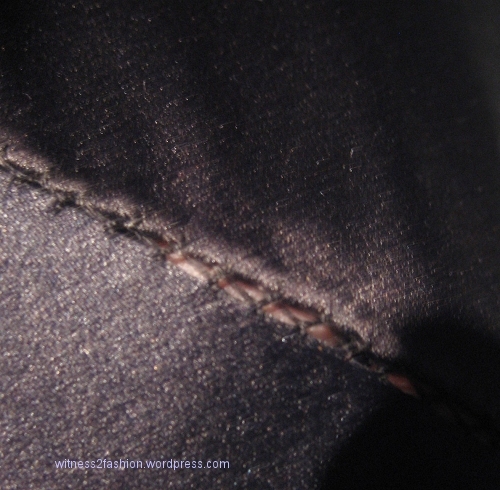 These loose seams allow even more stretch. Vintage black silk dress in private collection. 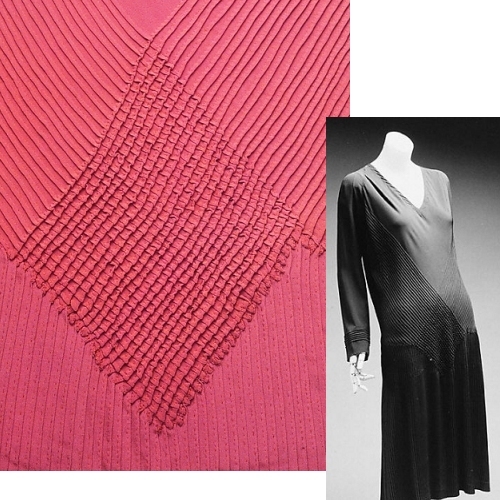 More about Sandra Ericson’s brilliant lecture on Vionnet in Part 2. “… Never have the shops made it easier to select dazzlingly beautiful slippers to complete the Christmas and New Year’s formal costume.” — Lucile Babcock in The Delineator magazine, December, 1928, p. 61. 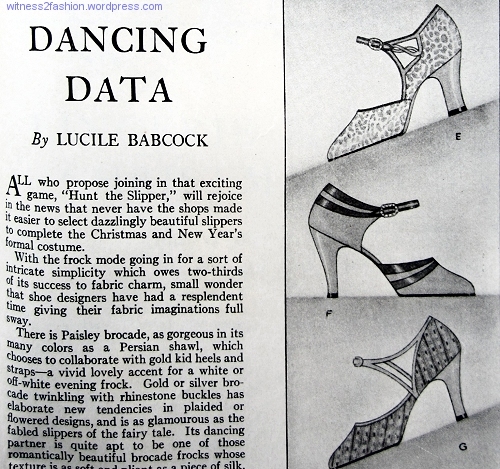 Top of article, “Dancing Data,” by Lucile Babcock, The Delineator; Dec. 1928. (A) is made of gold brocade trimmed with soft gold leather. 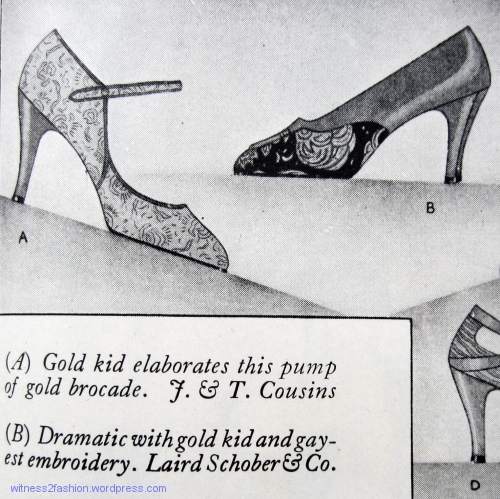 (B) is “dramatic with gold kid and gayest embroidery.” Dancing shoes, December 1928, Delineator. (C) is “ready-to-dye” crepe de Chine fabric. (D) is “silver and white brocade which may be dyed.” Dancing shoes, Dec. 1928, Delineator. (E) Gold or silver brocade dancing shoes from Arch Preserver. (F) Crepe de Chine pump made by Delman. 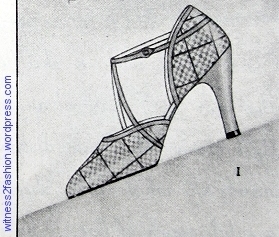 Dancing shoes, Delineator, Dec. 1928. (G) “Persian brocade and silver kid. Dance magic!” (H) Black velvet with scarlet satin inserts. Dancing shoes, Delineator, Dec. 1928. (I) is labelled “Red and gold paisley brocade” but clearly is not. (J) says “Rhinestones sparkle on the strap of this pump.” Dancing shoes, Dec. 1928. If you don’t know the online shoe museum called “Shoe-Icon” — based in Russia — it has a large, well illustrated collection and an excellent library of shoe trademarks. You can search for shoe designers by name or by trademark. (Translate into English by clicking at upper right of screen.) Shoes by the designers in this article are well-represented. 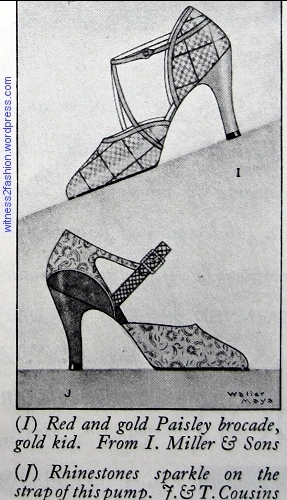 The shoes illustrated in this article came from I. Miller & Sons, J. & T. Cousins (click here for a very similar shoe — in color — at the Shoe-Icons site. ), Laird Schober & Co. (click here for a brocade shoe by Laird Schrober with rhinestoned heel, at Shoe-Icons,) Delman (Shoe-Icon shows many Delman shoes — click here), and Arch Preserver. 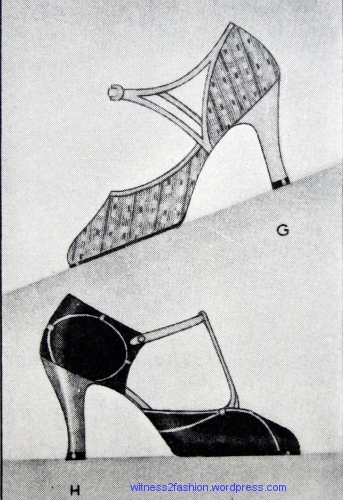 (“Arch Preserver ” and “Foot Saver” shoes, advertised for comfort, were nevertheless sometimes very attractive. The brocade one shown above (E) has a slightly thicker heel than the others. 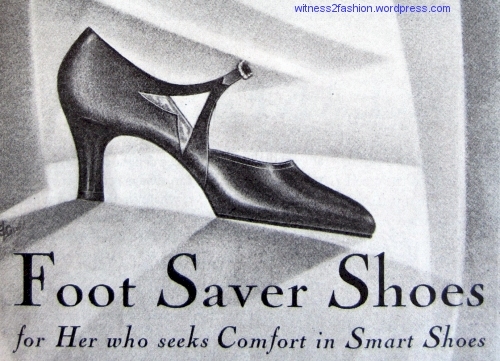 Woman’s Shoe from a Foot Saver ad, Feb. 1929. 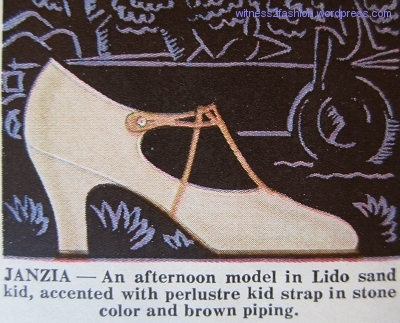 Day shoe from Arch Preserver, June 1929. Delineator. 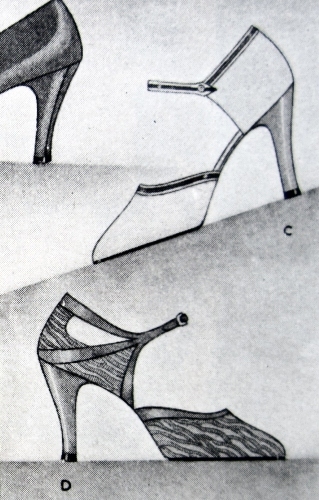 Israel Miller’s shoes were worn by fashionable women from the early 1900’s through the 1960’s. 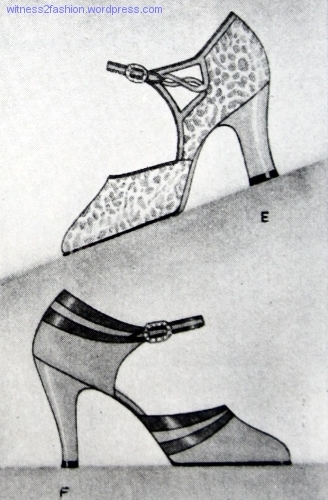 Andy Warhol was a shoe illustrator for I. Miller & Co. ads in the 1950’s. The Historialist wrote about the Warhol shoe ads here. Mrs. Reginald Vanderbilt (nee Gloria Morgan) in a sequin trimmed black velvet gown by Vionnet. Photo by Steichen. Pond’s cold cream ad, Delineator, June 1925. In answer to Christina’s question about the Vionnet disc dress— what were the sequins really made of? 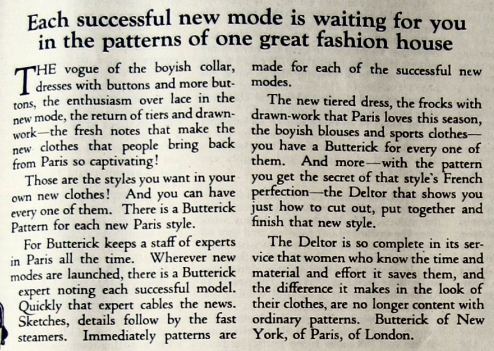 — I have to acknowledge that I only saw that dress in one source, Butterick’s Delineator magazine from April 1929. As Molly Ivins said of a former president, “There is nothing so dangerous as a man who has only read one book” — a good reminder for anyone doing research. Butterick Ad, August 1924, Delineator. Mrs. Vanderbilt, photographed by Steichen in a gown by Vionnet. Delineator, June 1925. 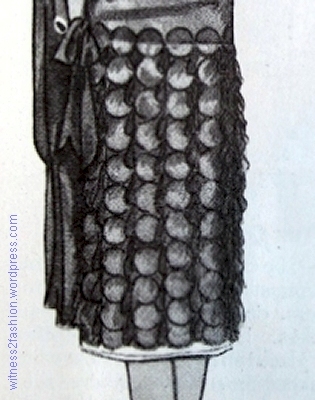 Vionnet uses sequins on a black velvet gown, Delineator, June 1925. Vionnet dress trimmed with discs, 1929 . 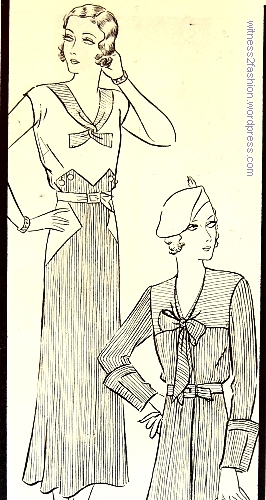 Sketches from Paris, The Delineator, April 1929, page 40. Whether the paillettes on the disc dress were celluloid or metal, I can’t say for sure, but “overlapping” metal that size would have been heavy for a “rose chiffon” support. (I suggested celluloid sequins; gelatin sequins have been used on clothing, but were unsatisfactory for several reasons — one being that they were water soluble….) So — if anybody finds out more about this disc dress, please let us know! Whether this is relevant or not: Many years ago, one of my friends was building costumes for a Russian circus that was going to perform in Japan. She visited their costume shop in Russia, and saw an unfamiliar machine next to a stack of clear plastic shirt collar supports — the kind used for packaging shirts so their collars don’t get squashed in shipping. When she asked, she was told that the machine was for making sequins — the costume shop had to make their own out of any scraps of shiny plastic they could salvage. When she got back to the U.S., she mailed them a big package of colored sequins. 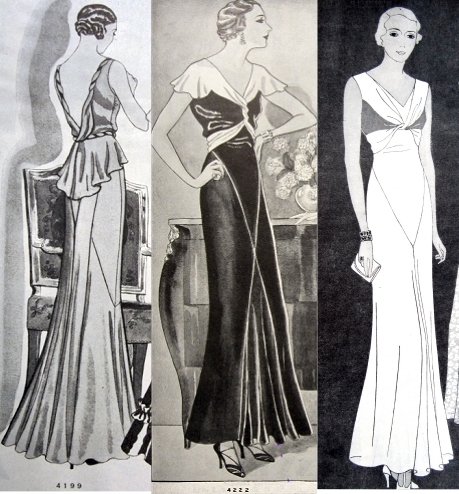 The two dresses at top are by Vionnet; at bottom, left to right, are gowns by Worth, Lucien Lelong, and Lanvin. April 1929. The Delineator. Paco Rabanne Disc Dress, 1965; Photograph from the Collection of the Metropolitan Museum. Detail of disc dress construction, Paco Rabanne, 1965. Metropolitan Museum photo. For a better view of the Paco Rabanne photographs, visit the Metropolitan Museum’s online collection. Click here. The 1960s disc dress was usually worn over a bodystocking. It was made for dancing. It wasn’t made for comfort — nor quiet. Skirt of Vionnet disc dress, 1929. I’m not saying Rabanne even knew about this Vionnet design. I’m just saying that, when it comes to using big discs on evening wear, Vionnet got there first. The wittiest, and best known, later variation on the disc dress has to be the one costume designer Lizzy Gardiner wore while accepting her Academy Award for The Adventures of Priscilla, Queen of the Desert in 1995. It was made of hundreds of gold American Express Credit cards linked together in the style of the 1960s disc dresses. I wonder if anyone has made a “disk dress” by wiring together old floppy disks. Probably. There is another Paco Rabanne disc dress (1967) in the collection of the Victoria and Albert Museum, but the site may take a while to load. Click here.